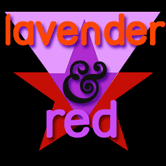 The protesters’ complete manifesto of demands served as an indictment, not just of what has become “corporate gay pride,” but including mainstream lesbian, gay, bisexual, transgender and queer organizations in general. It is also a call for the liberation politics that followed the 1969 Stonewall Rebellion, itself led by trans people of color. As the march of 25,000 reached the corner of Charles and Boylston streets, BLM organizers and supporters entered the parade, stopping its forward movement to forcefully deliver their demands to cheering supporters who lined both sides of the street. 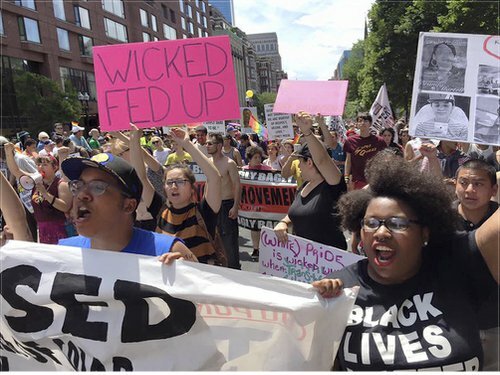 As BLM leader Daunasia Yancey was delivering an “occupy-style” mic check about murdered trans women of color, a contingent of Boston police confronted her and the other protesters, threatening arrest. But organizers refused to back down one inch until the planned protest was over, while the entire scene unfolded before hundreds of cheering onlookers. A phalanx of supporters from Stonewall Warriors, Boston Feminists for Liberation, the Women’s Fightback Network, Boston FIST, the Boston School Bus Drivers Union and the Boston Homeless Solidarity Committee moved between the police and the demonstrators at one point to defend the action. Over the years, the Boston Pride Committee has raised fees for marching in the parade to as high as $2,500 per group, with similar charges for reserving a booth at the official Pride Festival. (bostonpride.org) Grassroots and community groups with few resources are effectively prohibited from marching. “While many view Pride as a time to celebrate and connect with community, it is often a painful reminder for me of the lack of genuine inclusion and empowerment of faces who look like mine. I felt it was my duty to support the protest to bring awareness to what many people of color are still experiencing in Boston’s LGBT community and force those in power to put action behind their symbolic and meaningless rhetoric of diversity and inclusion.